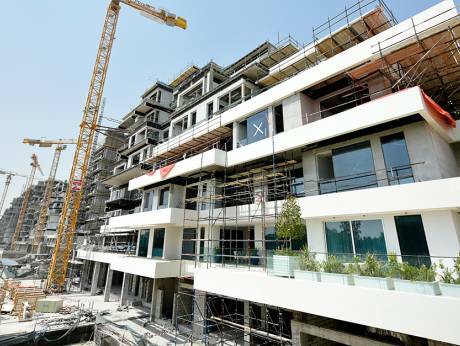 Dubai: Dubai’s developers are back to stocking up at the super-luxury end of the property market… the Al Barari cluster — opposite Global Village — has just launched a limited collection of 13 ‘Signature’ apartments bearing a price tag of Dh2,500 per square feet and more. And these units do not stint on size in any way, with the average being in the range of a quite substantial 5,000 square feet (including the terraces), averaging about Dh12 million, or $3.37 million. Al Barari itself takes up 20 million square feet. They form part of the Seventh Heaven apartment block the developer launched in 2014 and which is now 70 per cent complete. The 136 units (out of 157 overall) released at the time — with values averaging just under Dh2,000 a square foot — have been sold. “We remain reasonably confident about the response to the 13 units in The Signature Collection will generate among end-users and the long-term investor,” said Martyn Crook, Al Barari’s CEO for Asset Management. “This is not a relatively huge amount of stock that is being released. More of Dubai’s developers are getting comfortable with testing the market sentiments for high-end properties. Nakheel is expected to announce sales of apartments — including 12,000 square feet penthouses — at its newly unveiled Palm 360 tower, which also includes a hotel. Nakheel also has another twin-tower — Ibn Battuta Residences — heading into sales mode with more than 500 upscale units. Another master-developer has had a soft launch of Dh30 million villas, with the public announcement expected shortly. Market sources add that developers with projects at MBR (Mohammad Bin Rashid) City and Dubai Creek Harbour are keeping their powder dry for their own luxury launches. And the moment the market starts to pull itself up, especially at the top-end, they will be going after buyers at full throttle. The Signature Collection certainly has what it takes to live up its branding. The finishes that will be deployed at the 13 units will be far in excess of what the other apartments at Seventh Heaven — split into a G + 9-storey and G + 11-storey structure — will showcase. The entire project is headed for completion in the second quarter of 2017. Al Barari already has a resident base occupying its 189 villas. In the near term, the retail options available at the Seventh Heaven will also be keeping the developer busy. This will take up space along a 500-metre stretch on the lower and upper floors of the two buildings.